This is my all time favorite theme. I noticed that I do not see the background highlights on the feedlist, as elmer mentioned. I use Chrome, latest normal version and Osx mavericks. 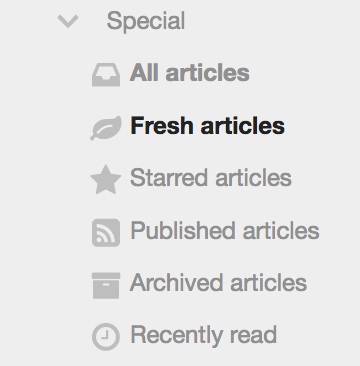 I removed the background for the active feedlist item some time ago, just like Feedly did. The screenshots show an older state. I try to keep up with improvements of the Feedly UI. In general, it got cleaner over time, which I like. There are very few things I sticked to from earlier versions, e.g. condensed fonts for headlines or colored links. It/would it be possible with the feedly theme, to hijack the combined view and instead of showing the entire article and the full sized images, to show a 4cm thumbnail and the first couple of lines? Similar to Feedly (before you hit 'o' to expand). It's not easy and not reliable because there is no dedicated thumbnail image in the markup. Maybe an additional tt-rss plugin could to the trick. is there any way to make "The End" element clickable? E.g. to run "mark all as read" action? @vip: no, it's not possible because this is only a theme. I tried to make plugin (js), but problems with connecting action to elements got me stuck (some Dojo commands are working well from console, but not as js plugin). I hope I will work it out. Dear developer of the feedly theme, first of all thank you for your fantastic work and for your theme that I appreciate a lot. I am currently using tt-rss 1.13 and your theme from GitHub (checkout from master branch). Everything seems to be working fine, except for two things. 1) Tabs headers at the top in the preference page are not themed (they have the main theme gradient background, pretty much like in the picture posted by a user on page 1 of this thread). 2) The Exit preferences button seems not to be clickable. I just jumped from the last original version of TT-RSS to the git master branch. I use "combined feed display". The issue is not seen while "Automatically expand articles in combined mode" preference is unchecked. Copied latest feedly theme from github. I am totally noob with css. I tried to put some code but did not succeed. I am using combined view with preview. But I have single line for Title and preview text. Is it possible to span it on 3 lines minimum to have more preview text and simplify expand actions and each line is very narrow for click. I'm still evaluating tt-rss, but I like this feedly theme best so far. It's a good base, and it's not that hard to customize. Here's some custom CSS I've hacked together to compress the feeds and headlines vertically, and make the unread message counts stand out when they overlap feed names. Thank you for the theme, it works like a charm. I only have one question. How can I change the 50% opening by default from the feeds. Half of the screen is too high for me, I just want something like 20%. I'm pretty sure is really easy to change the value from the css, i'm just a total noob. If anyone can told me which value update and where, I'll appreciate it ! You can just click and drag the top of the feed display to adjust the size, it is not fixed. The feedly theme doesn't have anything to indicate you can adjust the size of the article content and feeds listing, the bar is just a bit darker than normal, unlike the default theme which has a line in the middle which helps. The issue is as soon as you clean the cache / cookie, it comes back at 50%. I just want a hard modification so I don't want to deal with it each time. To be honest, if I could remove it, that would be awesome (didn't find any option tho). I just need the "article name" (the top side). Does anyone know why the "hide left column button" disappear ?